The passage of The Tax Cuts and Jobs Act, which NFIB helped get passed, increased the Section 179 deduction limit to $1,000,000 for 2018 and beyond. The limit on equipment purchases likewise has increased to $2.5 million. Section 179, a tax incentive created to encourage businesses to invest in themselves, allows small businesses to deduct the full price of qualifying purchased, leased, or financed products and services during the tax year. 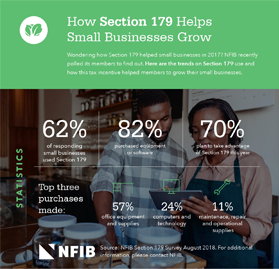 Review the How Section 179 Helps Small Businesses Grow infographic to the right to see how NFIB Members reported using the Section 179 tax deduction to make qualifying purchases in 2017. Save up to 40% on select computers and technology with exclusive member discounts. 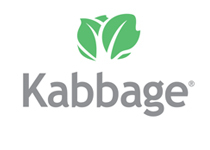 Members receive a $500 cash allowance and up to $1,000 in incentives on most vehicle models. Lines of credit up to $250,000 for your qualified business purchases and to grow your business while getting a break on your taxes. NFIB Member Benefits are offered by third-parties through contractual arrangements with the NFIB Member Services Corporation, a wholly-owned subsidiary of NFIB, or one of its affiliated agencies. Neither NFIB nor any of its subsidiaries or affiliated agencies is providing any products or services to you and they shall not be responsible for any claims or losses relating to the use of the NFIB Member Benefits. †Almost all types of business equipment and “off the shelf” software qualify for the Section 179 deduction. Consult your tax advisor to ensure any products you plan to purchase meet Section 179 expensing guidelines. All equipment must be financed/purchased and put into service by midnight on 12/31/2018. Click below for more information regarding special Section 179 zones.